Would you like to use your musical gifts serving with a contemporary band and representing Southeastern? 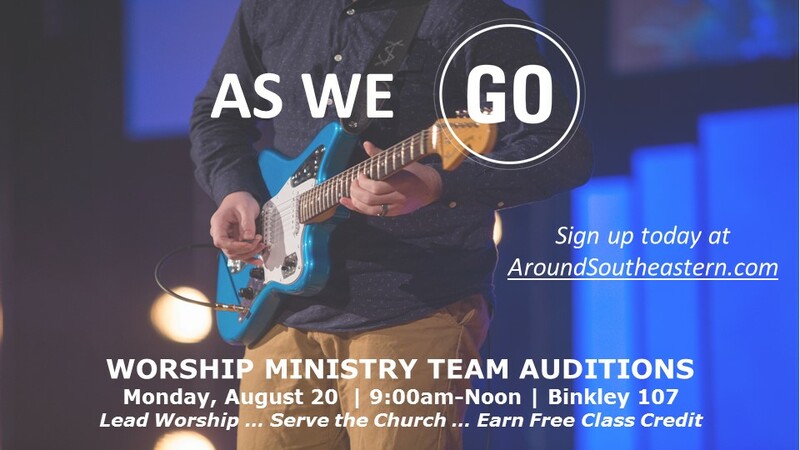 In an effort to serve churches and fulfill the Great Commission, Southeastern’s AS WE GO worship ministry team seeks to meet the musical needs of local churches. The team also occasionally leads for campus events. This team will travel 2-3 times per semester and will receive a free contemporary music ensemble credit. Auditions for the 2018-2019 team will be held on the morning of Monday, Aug 20 from 9:00am-noon in the Binkley 107 practice room. Deadline for signing up for an audition slot is Friday, Aug 17. For more information or to express interest, please contact Student Liaison Luke Hinson at lhinson@sebts.edu.